Niccolo Machiavelli (1469-1527) is among the most notable and influential political philosophers of all time. His theories not only concern government, but also analyze topics like human nature and behavior. Niccolo's works are still studied today, and are noted for being valuable yet also controversial. 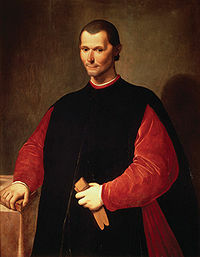 Niccolo Machiavelli received a typical Italian middle class education, and then got a job working for a banker. By age 29 in 1498, he was named head of the second chancellery of the Florentine Republic, and became a notable person in Italian politics and government. However, his career as a statesman and diplomat came to an abrupt end in 1512 when the Medici family (who ruled right before Niccolo was initially appointed work with the government) regained power and dismissed Niccolo. Shortly later, he was accused of conspiring against the Medici government, and was jailed and tortured. Although Niccolo was found innocent of the charges several weeks later, the Medici government continued to view him with suspicion. He was unable to secure any work with them, so he left Florence and went to a small town called Sant Andrea. Reflecting on his career with the government and his dealings with various leaders, Niccolo turned to political advisory writing. By 1513, he came out with a brief book called The Prince, which is now considered one of the most notable literary works ever, and a classic of political philosophy. His other works include The Life of Castruccio Castracani, Discourses on the First Ten Books of Titus Livius, The Art of War, and History Of Florence And Of The Affairs Of Italy: From The Earliest Times To The Death Of Lorenzo The Magnificenta. Niccolo wrote The Prince at a time when Italian politics was marred with blackmail, violence, and conflict. In The Prince, Niccolo gives advice on how to be an effective and successful ruler, and how to stay in power. The book was written as a practical guide to ruling that uses simple and straightforward descriptions in order to provide easily understandable advice. The Prince was groundbreaking because Niccolo described the world as he saw it. This was much unlike earlier political writers who treated politics as an extension of morals, and whose theories had little practical use. Niccolo's theories are based on the premise that a ruler must base policies on people's true nature. Although The Prince is intended advice for a monarch, its regarded not just as a political work, but also one on leadership, sociology, human nature, psychology, and philosophy. are interested primarily in themselves, and basically carry the mindset of "what's in it for me." often remain content and uncomplaining unless something horrible happens to them. can become very loyal to someone through receiving acts of goodwill, but even one's strong sense of loyalty is not absolute, and can be won or lost. can have their feelings towards others changed; i.e. with certain catalysts, they can turn against someone they favored, or they can have their favor won towards someone they used to view negatively. Subscribe to my mailing list to read great quotes, mini biographies, and more. You'll receive about two emails per month. I respect your time, and I won't send you anything that isn't really worth reading. In The Prince, Niccolo states that success is a matter of virtu--as in, skill, strength, cunning, and good decision making; as well as fortuna--in other words, chance, probability, and external factors outside of one's control. He believes that both factors play a near equal role in determining whether a venture succeeds or fails. He Niccolo then asserts that through foresight, one can hope to deal with fortuna, and thus maximize one's success. Niccolo then emphasizes the importance of adapting behavior to suit the times, and making timely and appropriate adjustments to circumstances. I believe that fortuna is the settler of one half of our actions, but that she still leaves us [by virtu] to direct the other half, or perhaps a little less. I compare fortuna to a raging river, which when in flood overflows the plains, sweeps away trees and buildings, and moves the soil from place to place. Everything flies before it, and everything yields to its violence without being able in any way to withstand it. But despite its nature, it can be said that when the weather becomes calmer, people can make provisions with defenses and barriers in such a way that if the waters rise again, they may pass away by canal, and their force will not be as out of control or as dangerous. And in the same way it happens with fortuna, who shows her power only where overboldness has not prepared to resist her, and in that direction she directs her forces where she knows that barriers and defenses have not been raised to constrain her. ... A prince can be seen happy today and ruined tomorrow even without having shown any change of his mood or character. ...The prince who relies exclusively on fortuna is lost when it changes. I also believe that he who suits his action to fit the times will prosper, but he whose actions do not accord with the times will not be successful. We see people different people attain glory and riches through different means: one with caution, another with haste; one by force, another by skill; one by patience, another by its opposite. ... Two men working differently can bring about the same effect, and of two working similarly, one can attain his goal while the other does not. ...If one governs himself with caution and patience, and then times and affairs move in such a way that his administration is successful, his wealth is made; but if times and affairs change, he is ruined if he does not change his course of action. But a man is not often found to be prudent enough to know how to adapt himself to the change. ....Having always prospered by acting one way, he cannot be persuaded that it is a good idea to leave it. Thus a cautious man, when it is time to turn adventurous, does not know how to do it, hence he is ruined; but had he changed his conduct with the times, his fortune would not have changed. Should a Leader be Loved or Feared? Despite his belief in using fear, Niccolo also states that a leader should definitely avoid being hated. "A prince ought to inspire fear in such a way that, if he does not win love, he avoids hatred; because he can endure very well being feared whilst he is not hated." To back up and further explain his theory on avoiding hatred, Niccolo describes the importance of having people's goodwill and support, which in a monarch's case can defend against both domestic revolutions (like widespread political activism) as well as foreign attacks. Niccolo feels that that rulers should hire quality ministers and servants who will be dependent on and look out for and the well being and interest of the state and the ruler. He also recommends that rulers should study servants and ministers, and make them feel encouraged to beneift the state. "When you see the servant thinking more of his own interests than of yours... such a man will never make a good [and trustworthy] servant." - "To keep his servant honest, the prince ought to study him, honoring him, enriching him, doing him kindnesses, sharing with him the honors and cares; and at the same time let him see that he cannot stand alone." Niccolo also points out that employing quality people will make the prince look wise to his subjects. Niccolo also recommends that taking advice from a small and trusted group of advisors, and only on matters the prince inquires about. Also, the prince who should use his own brain, and make the final decisions of importance. "When everyone is allowed to tell you the truth, the respect for you lessens. ... [A prince should] choose the wise men in his state, and give only them the freedom of speaking the truth to him, and only on those things that he inquires of. ... He should question them upon everything, listen to their opinions, and then form his own conclusions. ...He should let them understand that the more freely they speak, the more they will be preferred. ...He should be a constant inquirer and patient listener." Since the publication of The Prince, the term Machiavellian has been used both in and out of politics to denote a cunning, deceptive, and deceitful kind of resourcefulness. That being said, Niccolo's other political works are very far from promoting a Machiavellian philosophy. Most notably, Discourses on the First Ten Books of Titus Livius is aimed at republics (states controlled by politically active citizenry), and preaches themes of patriotism and civic excellence, as well as the use of open political participation and debate.